Labor Day Weekend in Yosemite, and traffic was predictably awful. It took us over 6 hours total to get to Yosemite on Friday night, arriving after 9:30pm. We were already exhausted, and still had to set up tents, air mattresses, sleeping bags, and put everything away in the bear box. Our campsite was right next to the bathroom, - the map shows the bathroom is 2 spots away; not true at all. This site was also not very flat - we were picking spots for tents and trying to avoid tripping over rocks in the dark - not too fun. It was after 11 before I was ready for bed, and there was a college aged girl in the camp next to ours that simply would not shut up. Before going to bed I finally decided to ask them nicely to quiet down and they complied. The next morning it took be quite a while to get organized and I didn't leave camp until 7:30. I saw almost no one on the trail to Mirror Lake - I saw one woman jogging back down the trail. Eventually a saw a morning hiker coming back down the trail as well.... how could I tell he was a morning hiker? He had a sweater on that was clearly unnecessary, and was using a comically huge impractical walking stick that was also clearly unnecessary. While I was continuing on the Mirror Lake loop toward Snow Creek, I saw a black bear on the trail directly ahead of me. He noticed me at the same time I noticed him. Unfortunately my camera was in my buttpack. I turn the buttback around slowly, got the camera out, all the time the bear was watching me. I wasn't at all afraid of the bear, but I wanted pictures. By the time I started switching lenses - a good 30-45 seconds after the bear saw me - he was in the trees. By the time I was ready to take his picture - nearly a minute after he saw me - he was too deep in the trees to pursue. I started kicking myself for not having the camera ready and blowing a perfect photo op. Less than 3 minutes after loosing the bear in the trees, I saw another bear coming down the path in front of me. This time I was ready, and I opened fire quickly, taking a couple dozen pictures and plenty of video. 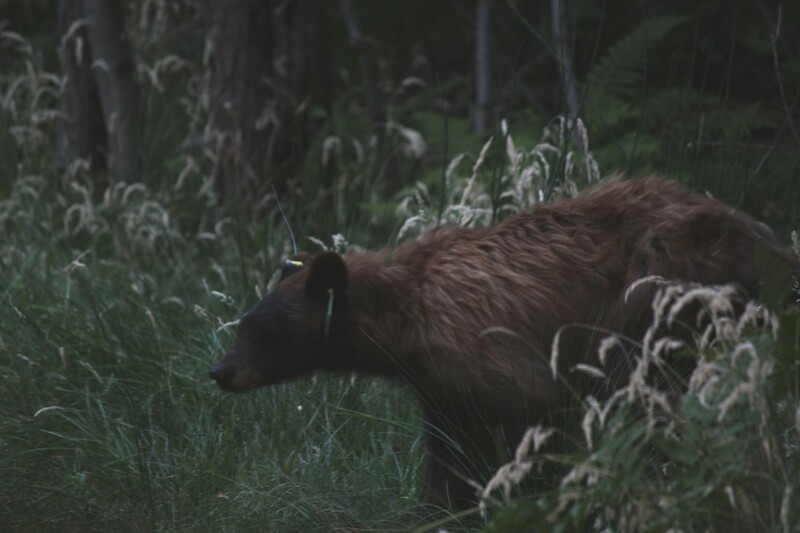 This bear was less skittish than the first bear, and made his way around me in the woods only about 50' from the trail, and then returned to the trail in back of me, continuing his journey towards the campgrounds and breakfast. I few minutes later I reached the base of Snow Creek trail, and saw a jogger headed down Snow Creek and back toward camp. I warned him that there were two bears on the trail ahead of him. In a German accent he expressed concern, but I told him he'd be fine as long as he didn't startle them. Germany has long since killed all their bears, and recently killed the first bear sighted in Germany in over 100 years. I took a few pictures of the mileage markers and started up the switchbacks of Snow Creek trail. 8:40am, 2.4 miles from the stables. d) I'd been up Snow Creek trail before and knew I could do it - the trail is steep, but there are no stairs to speak of. In May 1996 I tried to do this loop once before, only to be turned around by snow in the high country - I couldn't follow the trail, and getting lost seemed like a poor idea. I'd also seen a rattlesnake on one of the switchbacks of the trail in 1996, so I was especially alert this morning. The March 28, 2009 Awhiyah Point slide is visible in the center. Just left of the top Half Dome, you can see the very steep granite approach to the Half Dome cables. 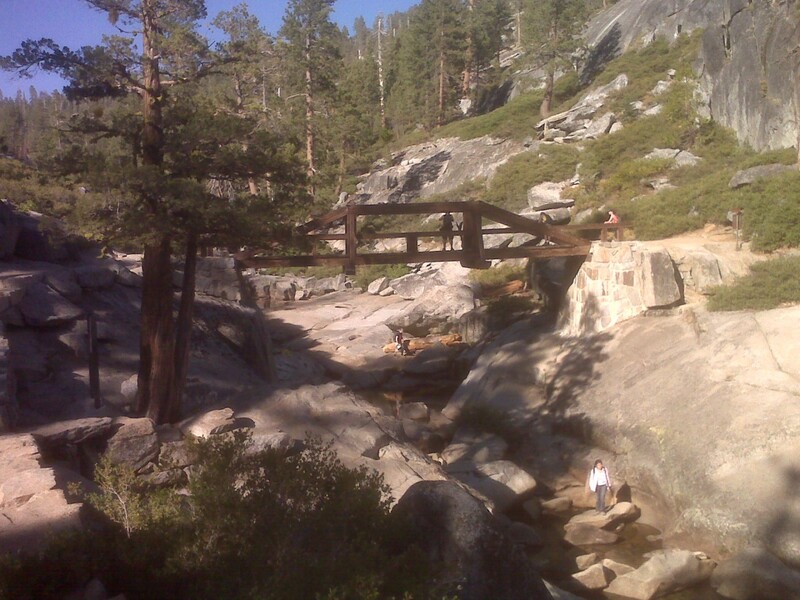 The approach features steps cut into the granite and was repaired over the last few years by trail crews, closing the trail during weekdays. I took a couple of breaks in the shade on the way up. I made better progress than I expected, judging my progress against the walls across the canyon. Mirror Lake and Half Dome were in the shade all morning so the pictures were none too impressive. As I tried to take a picture toward the top of the trail, the camera refused to work. I had the book with me so I spent a quite a while troubleshooting to no avail. I was not pleased that my <90 day old not-too-cheap camera had bit the dust, and now my only camera was the worthless camera on my Blackberry. I remembered that I had packed an extra 8G memory card, and decided that I would beg anyone I could to use their camera when I got to North Dome to try to salvage some pictures out of this mess. Snow Creek doesn't really top out like many canyon trails do - the climbing becomes easier and more gradual, but there's no definite rim that says 'you're here'. I finally encounted another hiker - I younger guy with a full pack was coming down the trail. He had separated from his party of 3 others cause he was feeling sick and wanted to get out of the backcountry. The rest of his party was going to be on Cloud's Rest this morning, where his sister's boyfriend was likely to propose to his sister. I got the intersection near the bridge over Snow Creek. It is nothing exciting, and I think I'd gotten this far before. The forest is not at all dense up top, leaving plenty of sunlight coming down on anyone crazy enough to hike here. The trail continues up, gradually climbing the Snow Creek drainage. Now it was getting late - around 11am, and I realized that I was nowhere near getting to North Dome. Now I realized I was making worse time than I expected, and I had alot of hiking to do. The trail makes a switchback when it runs into a tributary of Snow Creek, then returns back for another visit after climbing uphill for another 5 minutes or so. There I saw a group of 6 college aged hikers with full packs on refilling their water bottles with a filter in the creek at the waterfalls. They were all busy talking amongst themselves - only their guide would talk to me. He was perhaps my age, and told me he guides parties into the backcountry regularly. This group had apparently done this hike as kids and were having a reunion of sorts. After a few minutes I asked one of them of he would refill one of my water bottles, since they had a filter - he seemed a little put out but complied. I started with about 6 liters of water, which is more than I've ever used on a hike, but it was hot and it seemed stupid to pass a perfectly good opportunely to top off without doing so. I pulled out my low-res topo maps that I'd printed for free online and decided I was finally near the intersection of the trail that goes back out to North Dome. The trail continued uphill - I had now been hiking uphill for over 4 hours. Finally I reached the intersection at noon. I was surprised to see the sign indicate we were only 1.5 miles from Tioga Pass road - coming in from the road would be cheating! I stopped for lunch. I don't bring much real food on these hikes - a couple small bags of chips, a couple of apples, a sandwich, and plenty of sugary candy to keep me going. I was really running late now - it was already noon, and I was still 2.5 miles from the North Dome turnoff. Then I had to get out to North Dome - another half mile each way on a class 1 scramble, which I was expecting to be steep and scary. Later I still had to hike a few miles over to Yosemite Falls before coming down the Yosemite Falls trail. The trail toward North Dome soon started up again. I was tired of hiking up, but it wasn't too steep or entirely unexpected. I saw plenty of dayhikers coming back from North Dome - they had all come from Tioga Pass road. Almost all of them were woefully unprepared for this hike - most of them were clearly out of water. I saw a family of 5 carrying a total of 5 quart bottles, all of them nearly empty. I passed by the turnoff to Balancing Rock - I'd decided it wasn't worth the legwork to see and I was off schedule anyhow. I was fairly confused when I started seeing a relatively unobstructed view of Half Dome and could not see North Dome. Then the trail started downhill, and I still couldn't see North Dome. I remembered from the topo maps that the trail went down before North Dome, but not even being able to find North Dome from here at least meant I wasn't likely to have to climb very far up it to get to the top. The trail continued downhill for another 15 minutes or so before the intersection to the half mile North Dome trail. It was now after 1pm. More downhill. Fortunately the 'class 1 scramble' aspect of this hike was vastly overstated. I got down to the start of the Dome itself and found an older couple with full packs in the trees who were searching for the best place to pitch a tent. I got up my nerve, wandered over toward them, explained how my camera had died, and begged them to let me borrow a camera. My memory card was too new to work in the woman's older point and shoot Nikon, but it worked in the guy's Canon A720 8 meg point and shoot. I wandered out onto the Dome and took pictures for about 10 minutes at most. The battery indicator came on immediately, and I had no idea whether this guy had spare batteries, so I was much more conservative in my picture taking than I would have been otherwise - I took perhaps 20 shots total. When I wandered back and found the couple I told them I noticed his battery was low and asked if he had more - he said he did (I wish I had known that earlier!). I thanked him profusely and gave him a $20 to buy more batteries (I probably would have given him just a $10 if I'd had one, but the pictures are worth it to me), and told him he'd restored my faith in humanity. He tried to refuse my donation briefly before thanking me. My hike was no longer in tatters; I now had the picture's I'd been hiking for. 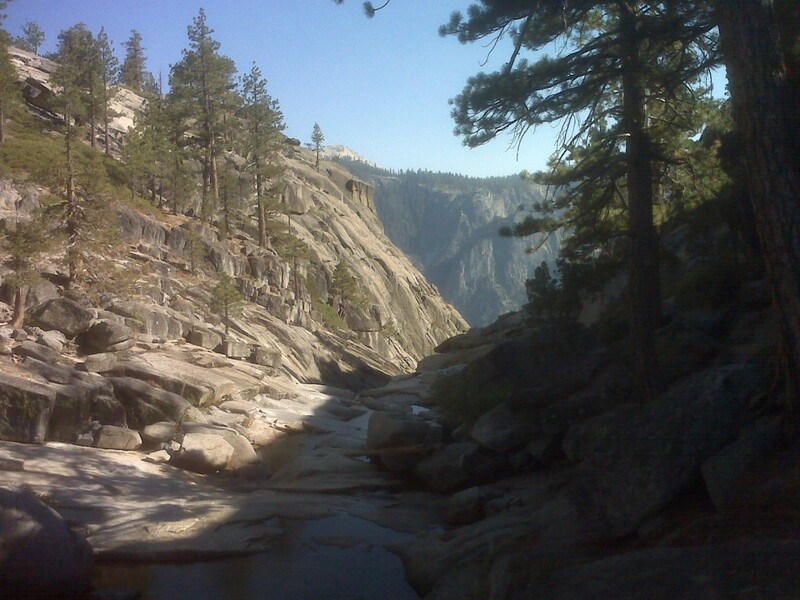 I then hiked up to the main trail and north towards Yosemite Creek. I was positive that I would not see another person on this trail until it re-joined the main trail in an few miles, and I was right. Unfortunately the trail went up and down as it made its way into side canyons along the rim. I'm used to Half Dome and other trails that are all up, then all down. This continuing climbing was getting really old after 8-10 miles and I was really starting to drag. At around 3:30 the trail started to climb out of a very serious side canyon and I consoled myself with the belief that this had to be the last side canyon before Yosemite Point. Fortunately I was correct. 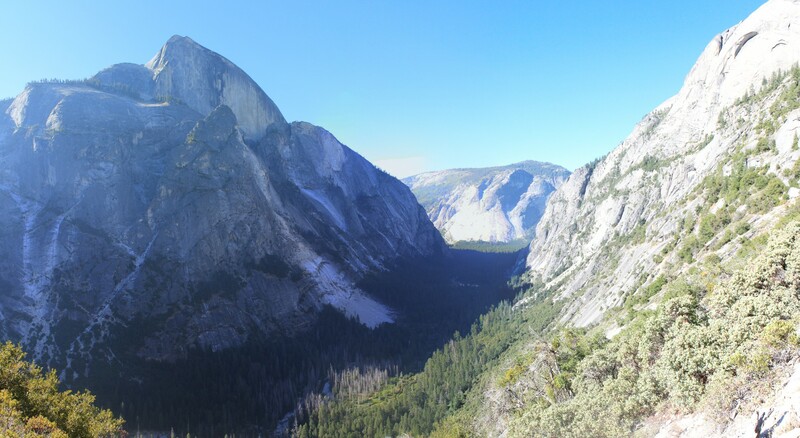 I found a trail to a great overlook that wasn't labeled so it apparently was not Yosemite Point, and a few minutes later I found Yosemite Point itself. I might have missed it had there not been 2 couples in their mid twenties near the remnants of an old fence made of rusted pipe. Since this was the first manmade structure I’d seen other than a trailsign I assumed we were at Yosemite Point. Looking over the fence was breathtaking – it was at least 2000 feet straight down to the valley floor. We were looking out over Yosemite Village. I took some pictures with my Blackberry for a few minutes, then I noticed the two guys were over at the end of the fence looking back towards Yosemite Falls. I wandered over cautiously since the ‘fence’ ended where they were standing, and we were looking right at Lost Arrow, and there were 3 climbers on top of the Arrow and another climber jumaring the span over to the Arrow. This was fantastic! I told them this was ‘Lost Arrow’ – they were Russian, and one of them repeated ‘error’ a few times – finally the other one mimed a bow and arrow to explain the name. After another minute or two I got up the nerve to ask to borrow their camera and they happily agreed. I quickly took about 15-20 shots of the Arrow and the Valley below. This was a DSLR and it took great pictures averaging 5 meg in size. It was now after 4pm and I was really running late. I figured best case it would take another 2 hours to get down to the Valley, and then it would take at least another 30 minutes to get back to Upper Pines. I called Kathy and left a voicemail, and Kathy quickly called back on CJ’s phone. She said her phone rang but wouldn’t pick up and the voicemail would work, and CJ’s phone was nearly out of batteries. I gave her an update on my ETA. The trail down from Yosemite Point to the creek is very hard to follow – I found scattered pylons, but lost the trail several times. You could see where you needed to end up so there was no real danger of getting lost, but I wanted to be done with this hike. Eventually I found the bridge over the creek. In early September the creek was a collection of puddles and was no longer flowing. c) The path down to the overlook is now a narrow 18” ledge along the cliff about 30’ over the Overlook itself. d) There is a single railing on the cliff side of the path and no outer railing, making this perhaps the most exposed ‘path’ I have ever seen. I had no problem with the Garden Wall exposure in Glacier, but this was nuts. This was as far as I was going. I climbed back up the stairs and walked back to the main trail. 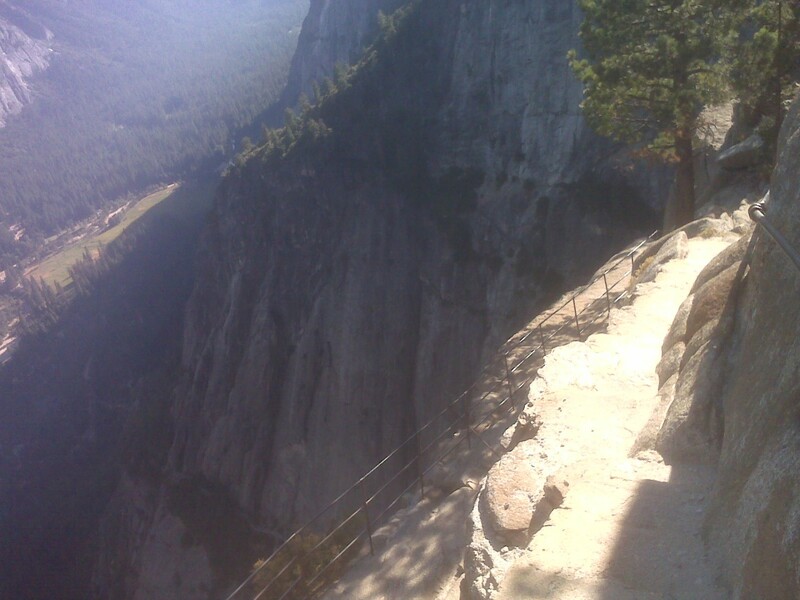 I then started down the Yosemite Falls trail. It was now approaching 5pm. It was perhaps the steepest trail I’ve ever hiked, and was almost entirely granite stairs, covered with gravel and dusk to make it very slick. The only other trail I'd been on like this was Hermit Trail in the Canyon and I absolutely despised that trail. I was now completely exhausted and I didn’t dare take big steps cause I knew I’d slip and fall. I saw a family – two adults and a young girl - headed down very, very, slowly, but I didn’t see anyone else. As you head down the canyon wall become larger and larger, and soon it is looming several hundred feet over you. Reminded me of the Grand Canyon. I kept hiking down, down, and down. I slipped once and nearly did a faceplant, saved by my hands. Once I got out of the canyon next to Upper Yosemite Falls I never even bothered to look back to see the falls – I just kept hiking. It was now approaching 6pm. I left Kathy another voicemail, then tried both CJ and Robby’s phones. Kathy called me back on Robby’s phone. I asked her to bring me a complete change of clothes, some water, some soap, and paper towels, and meet me at the food court at Yosemite Lodge in about 45 minutes. As I continued hiking the trail went uphill again… unfortunately. The trail was almost entirely in the trees, though occasionally I could sense that there was some serious exposure just past the treeline. Finally I got past Columbia Rock, headed down the now non-granite trail, and made it to Camp 4 at around 6:40 – I called it 11 hours and 11 minutes of hiking. It was another half mile to Yosemite Lodge – I waited there for perhaps 10-15 minutes before the family showed up and we had dinner. I gorged myself on a Philly cheese steak, something I would not normally select but I had earned it. In retrospect, I do not need to hike up Snow Creek again... ever. However I would love to do this hike by 'cheating' and starting from Tioga Pass Road - that would give me lots more time to appreciate the scenery on the rim. 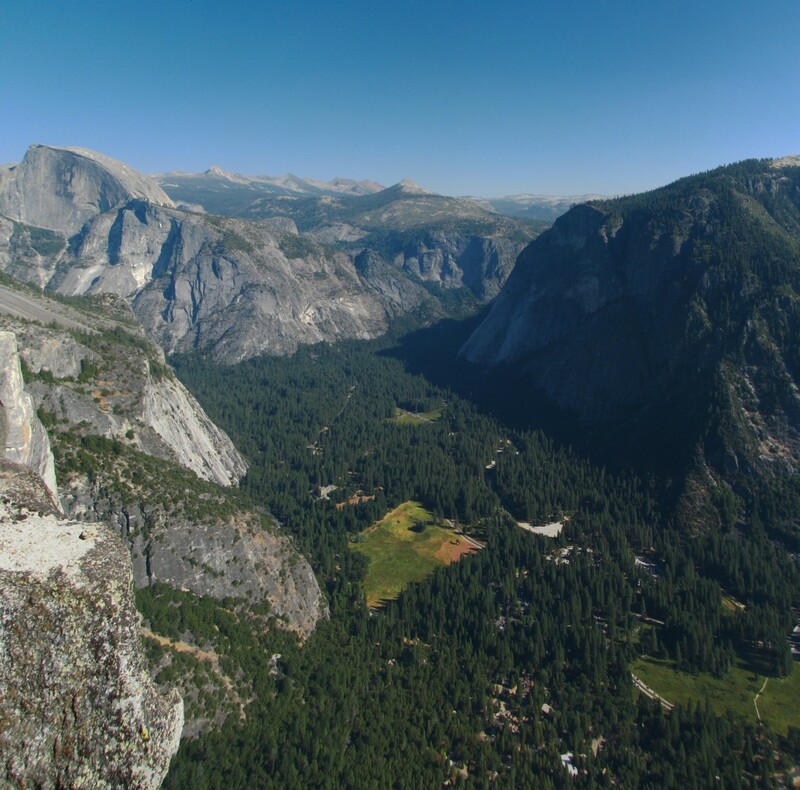 The view from the rim of Half Dome is one of the most beautiful views I've ever seen. Almost as good, it is not crowded with teaming masses like most of the rest of Yosemite around the valley.